When Teen Wolf was released Michael J. Fox was the hottest young actor in Hollywood. 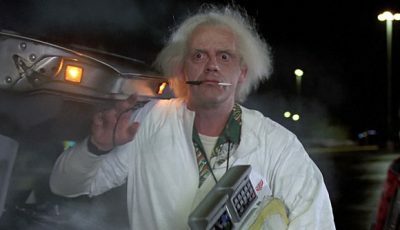 The film was shot and finished before Back To The Future but only released after the success of the time-travelling adventure story. 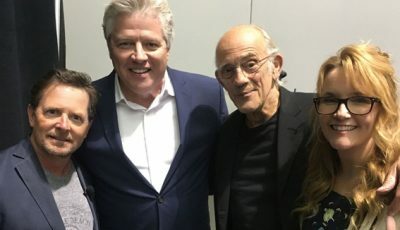 Originally, Eric Stoltz was cast in the role of Marty Mcfly in Back To The Future but director Robert Zemeckis never felt he was right for the part. When Fox became available after completing work on Teen Wolf, Zemeckis, having relieved Stoltz of his acting duties, hired Fox for the film and the rest is history. The studio, Universal, seeing the success of Back To The Future’s opening weekend, released Teen Wolf to coincide with Fox’s new found stardom. It worked to perfection. The film debuted at number 2 on its opening weekend. The only film taking more money than it was, unsurprisingly, Back To The Future. 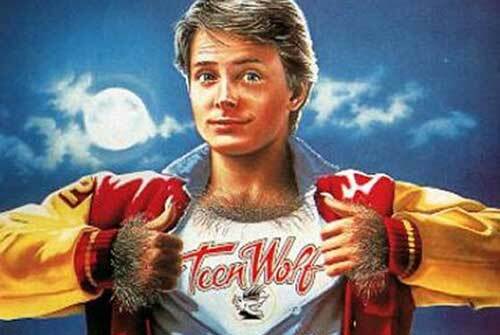 Looking back Teen Wolf doesn’t hold up as well as Fox’s time-travelling adventure. Its financial success was down to shrewd marketing on Universal’s part and the popular appeal of Michael J. Fox, as well as the film’s release coinciding with the crest of Back To The Future’s box office wave. However, it’s a fun take on the werewolf story with a little John Hughes-inspired teen angst and the trappings of a sports movie brought in to restore order to the film’s loose plot line. By the time Back To The Future III had been released Michael J. Fox had become the go-to star for lightweight romantic comedies. His likeable good looks and cheeky humour was a crowd-pleaser and, perhaps more importantly, a winner with the ladies. For Love or Money sees Fox play a happy-go-lucky concierge at a top New York hotel with the dream of one day owning his own establishment. In many ways it is a loose update on The Secret of My Success with a more 1990s-inspired slant towards self progression. The film is worth seeing because of Fox. Like the actor himself (a good-natured, easy-going, pleasant on the eye, funny and charming persona), the film will win the hearts of those willing to let a little sentimentality and a whole lot of whimsical romance be the order of the day. Michael J. Fox doesn’t have a major part in Mark L. Lester’s passionately anarchistic Class of 1984, a film released in 1982 that wanted to draw attention to the growing problem of anti-social and criminal behaviour in American schools. It was one of Fox’s earliest film roles, appearing here as the fresh-faced, good-natured student of a tough, inner-city school. Fox is certainly inexperienced but the film is an excellent counter portrayal to the Savage Steve Holland/John Hughes depictions of teenage youth in the 1980s that would appear later during the decade. Because it is such a good film, and worthy of a mass audience, it deserves its place on this list. Jonathan Lynn has a way with ensemble casts. He knows instinctively how to manage a disparate group of characters and Greedy is no exception. He proved how to handle comedy and the ensemble cast in the brilliant Clue, and here he does it again with the family of Joe McTeague. Not only is McTeague played by Kirk Douglas, but we also have Ed Begley Jr., Bob Balaban, Phil Hartman, Olivia d’Abo, and Colleen Camp lining up as relatives eager for his money, not forgetting star Micheal J. Fox and love interest Nancy Travis. Lynn also shows up as McTeague’s faithful butler. 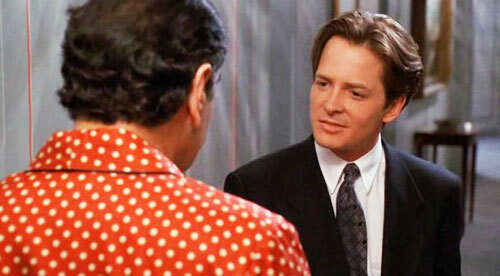 Greedy might be a lightweight comedy without the sweet-natured narrative of Lynn’s Three Men and a Baby or the devilishly inventive concept of Clue, but it’s frequently amusing and features one of the funniest, and most underrated, opening sequences of any comedy in the 1990s. Oh, how comedy misses Phil Hartman! Have you seen the Pixar film Cars? 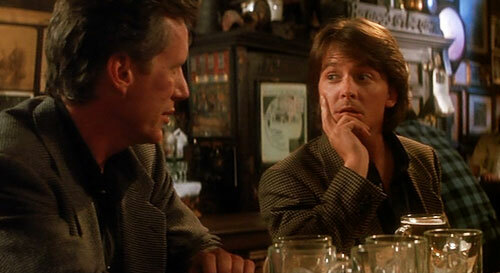 Doc Hollywood and Cars share a similar plot line of the big city hotshot forced to spend time in a small town community where he learns something about himself and finds someone to love. The film is a by-the-numbers romantic comedy made worthy of viewing thanks to a wonderfully eccentric group of colourful characters. For the urbanite lost in suburbia genre Doc Hollywood out punches most of the competition. 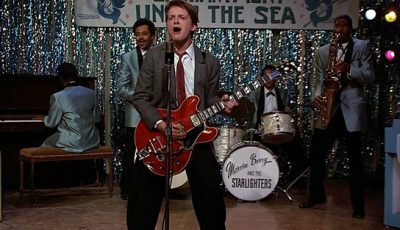 The Secret of My Success was a film released to coincide with Michael J. Fox’s sudden stardom thanks to Back To The Future. It’s a fun film with a typically 80s mentality of self-worth, career paths, financial success, and big business. It never becomes preachy though and remains funny throughout thanks to an energetic performance from a youthful-looking Fox, the experienced direction of genre veteran Herbert Ross, and an assured, crowd-pleasing script from Jim Cash. 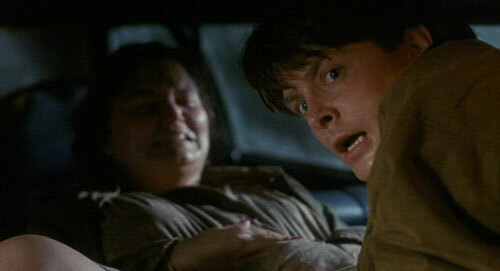 The film ended up being one of Michael J Fox’s most financially successful films after the Back To The Future movies, becoming the 7th highest grossing film of 1987. Michael J. Fox was riding the crest of a wave after the success of Back To The Future. Although comedy has always been his strongest suit, he tried his hand at more dramatic work with films such as Light of Day and Bright Lights, Big City. Most successfully however was his work with Brian De Palma on the Vietnam war film Casualties of War. One of Fox’s most reserved yet powerful performances is delivered in a hard-hitting character study of soldiers during the conflict. The film also boasts a brilliant performance from Sean Penn who would later work for De Palma again in Carlito’s Way. John Badham’s The Hard Way is a buddy-cop comedy of the highest order. Why? Because it has the defining ingredients spot on: Michael J. Fox and James Woods play the buddies, and couldn’t be better cast. This is the funniest film Fox has been in thanks in no small part to James Woods’ caustic, chaotic pissed-off-guy-with-a-badge performance. Woods has rarely been better in a comedy and this is arguably one of his finest performances. That Fox doesn’t get upstaged is testament to his own turn as a reflexively-conceived Hollywood superstar desperate to go the way of John Sullivan and bring meaning and societal worth to his next film. Fox’s overt enthusiasm is the perfect counterpoint to Woods downtrodden cynicism. The Hard Way is an underrated comedy gem. The last hurrah for Fox before the onset of Parkinson’s disease forced an early semi-retirement from screen acting is a perfect way to bookend a short but entertaining career. It is also the film that set Peter Jackson on his merry Hollywood way after finally breaking into the mainstream. His earlier schlock horror-comedies were loved by the few people that had seen them but at the time had failed to ignite audiences away from his New Zealand homeland. The Frighteners sees Fox play Frank Bannister, a paranormal investigator and con artist who uses his spectral buddies to haunt homes in order for the disturbed inhabitants to call on him to ghost-bust those poltergeists out of there. He meets his match when an ungodly spirit with evil intent starts making things go bump in the night for local residents. Now the only man in town who can see spirits but has no real clue how to get rid of them must do-it-himself in order to get the girl and discover what really happened in the car crash years earlier that killed his wife. The film shows off the skill of Peter Jackson – his eye for imaginative special-effects and fast-moving plots held together by classical Hollywood narrative. His script, co-written with wife Fran Walsh, is knowledgeable of horror films from the past, and is certainly in debt to Sam Raimi’s Evil Dead films and John Landis’ An American Werewolf In London in terms of mixing horror with comedy. Part of the charm of the film is the fact it is frequently funny, and its inventive play on the paranormal is a forerunner to popular television shows such as Most Haunted and Ghost Hunters. 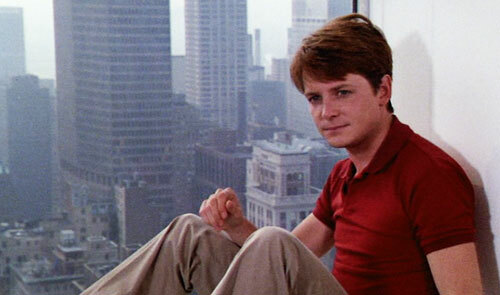 The film that would forever maintain Michael J. Fox’s place amongst the stars of 1980s pop culture is by far his greatest work. It is a fair argument to say that without this time-travelling adventure a top ten Michael J. Fox films list would be redundant. Either the small-in-stature-big-in-personality actor would have never made the jump to big-budget feature films from his regular-paying TV job, or simply his later work would be that unfortunate breed: likeable but quickly forgotten. Wow, Frighteners up there at number 2? Can’t say I thought of that one in my own list, Dan! 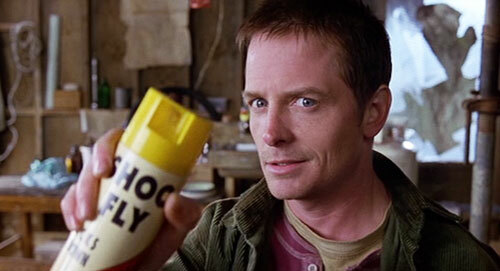 Frighteners is a great film, but I’d have had it well down the list (if it was included at all). I think The Hard Way was ordinary, to be honest, but I may have been in a crappy mood the day I watched it, and don’t have fond memories of it. Greedy & The Concierge would have been higher (they’re fantastic films) and I’d say Secret Of My Success is one of Fox’s best non-BTTF efforts. I most certainly agree with your choice of number one, though. Back To The Future is a great film series, and one of the truly great Hollywood trilogies (regardless of the critical panning of number 2! ), and is Zemekis’ best work on film. I can’t say I’m as well versed in the Michael J. Fox universe as I could be, and I’m not sure I would have put them in the exact order you have rockin’ here, but of the films listed that I have seen I would have definitely included. The Secret Of My Success is still a film I can watch again and again and enjoy it just as much without missing a beat. Fox is one of the most enigmatic and entertaining actors of the last handful of decades. I’m more familiar with his work on Family Ties, Spin City, and hilarious cameo’s on Scrubs. He’s a brilliant icon of the industry. Haven’t seen a lot of these, and some I only saw as a kid…but I would definitely have the same top two as it stands now. So nice to see something good about the Frighteners. I love that movie! It’s a great mix of Peter Jackson’s early wacky nature and a Hollywood budget. Jeffrey Combs is a great as the villain also! 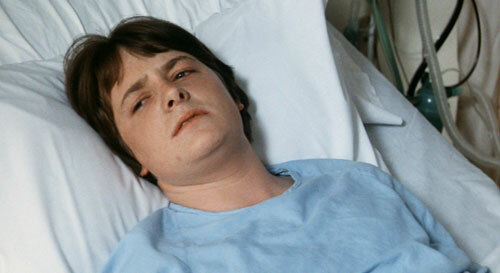 I’m not really familiar with Michael J. Fox’ filmography other than him being Marty McFly, and de Palma’s Casualties of War. Glad to see Casualties of War high up on your list and obviously Fox will forever be associated with Back to the Future. Great list Dan! Great List! I love the Secret to my Success. I would probably move Teen Wolf waaaaaaaay up though! Micheal J. Fox..an awesome actor and a great man..we’re so unlucky that he stopped doing movies so early for parkinsons..i love his every film and every work..he’s damn good..each of his films are best to me..well besides this list there other MJF movies like “Life with Mikey” and “Light of Day”, “Bright lifgts big city”, “Stuart Little 1,2,3″,”Homeward bound 1,2” and many more which are classics of Hollywood. Love this man..we need more good people like him who would care for others..MJF rocks. Awesome list, guys! I’m a Michael J. Fox fan but I’ve only seen a handful of his movies so far, and I’m always looking for new ones. Definitely will get round to seeing some of these. Pleased to see The Hard Way is high up there (a hugely underrated film), as well as The Secret of my Succe$s. No Bright Lights, Big City though? Come on guys, that’s one of the best performances of Fox’s career! Not a big fan of the man, but he is watchable. For what it’s worth …. (3) MJF may have been OK in The Hard Way, but Woods stole it lock, stock and barrel. (4) Saw him on TV the other week playing golf with Bill Murray. Gotta give it to him – admirable strength of character and a sense of humour to boot … a truly gutsy bloke. Really good list glad to see Secret of My Success one of his lesser known films. However I would like to have seen Bright Lights, Big City on here is acting is amazing in this. Take out the parts of Casualties of War that takes place in the modern times and it is one of the best war films ever made. Penn and Fox are incredible in that film. Secret of My Success is simply awesome. 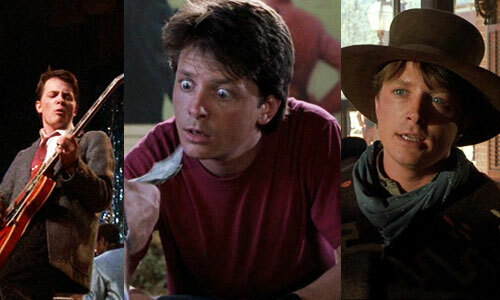 Back to the Future needs no mention as it is one of the best film series of all time. of seen Light of Day on the list! As another commenter mentioned How could I forget to mention this movie in my previous comment. Fox is excellent here and it’s such a good story his chemistry with Joan Jett is well received. Hard to find on DVD! It was nice to see him at the Oscars with Seth Rogen but it’s a little bit unfortunate that he’s not acting in Hollywood anymore. Parkinson’s disease it’s so terrible.